The vote was split along party lines, with all 11 Democrats on the Senate Health, Education, Labor and Pensions Committee voting to reject DeVos, and all 12 of the committees Republicans voting to approve her. Next, DeVos faces a full Senate vote.Two Republican senators on the HELP Committee, Susan Collins (Maine) and Lisa Murkowski (Alaska), suggested that they were not sure how they would vote at that point. I have not been persuaded that Betsy DeVos will put students first if she were confirmed and I have not been persuaded that she has the experience, skills, understanding or vision to lead this critical department at a time when it is more important than ever, committee ranking member Patty Murray (D-Wash.) said Tuesday before the vote. There is so much about Betsy DeVos record over the years that we can look to when we make this decision. Since DeVos hearing, Democrats submitted over 800 additional written questions to the nominee in an effort to get more details on her views.By Monday evening, DeVos had responded to all of the questions, but some Democrats complained that her answers were not sufficient and actually raised more questions. On Monday afternoon, Murray once again pressed for a postponement of the vote. After an initial review of the responses sent to Committee members with less than twenty four hours before the scheduled vote, staff has identified a number of critical questions about Ms. DeVos financial disclosure to the Committee and other areas that have not been answered to anywhere close to satisfaction, said a Monday statement from Murrays spokesperson, Eli Zupnick. Senator Murray does not believe that members of the Committee have enough information about Ms. DeVos opaque finances, conflicts of interest, and other issues. 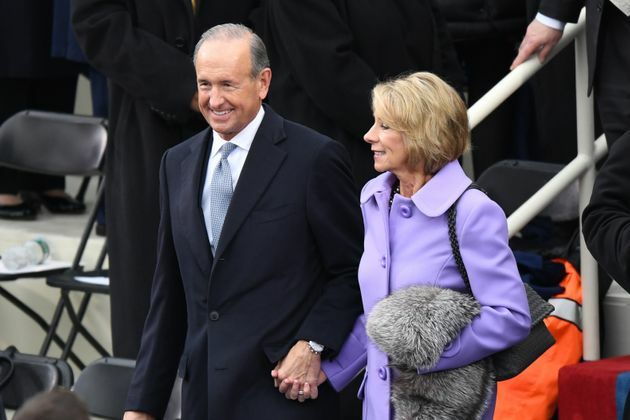 DeVos, a Michigan native, comes from a billionaire family that has donated millions of dollars to members of Congress.She is a passionate education activist, mostly involved in causes that prop up private and charter schools. Her opponents say that her interest in these institutions comes at the expense of traditional public schools which a vast majority of American students attend and that her views could have disastrous consequences for the public school system. DeVos has never formally worked in a public school. She is a staunch opponent of teachers unions, and a broad coalition of civil rights groups also say they are worried about her ascent. On Monday, about 250 national and local civil rights groups signed an anti-DeVos letter, saying that she has demonstrated no previous commitment to ensuring equal educational opportunity in school. Several Democratic lawmakers report having seen an influx of anti-DeVos calls from constituents, and some have even begun capitalizing on the fierce opposition to her as a fundraising tactic, reports Education Week. The progressive change network CREDO Action collected over 1.4 million signatures on an anti-DeVos petition,a record for the group. I dont think its fair to treat Ms. DeVos so different than we did Obamas nominees, Alexander said. I respect my colleagues, I dont question their motives, I dont question their votes, but I believe their concerns are misplaced. Also during Tuesdays HELP Committee panel,Murray called for a vote on an amendment that would require Cabinet nominees to release their tax returns. I have asked each Cabinet-level nominee that this committee will consider to submit three years of tax returns but so far each has refused, she said. So I am hopeful we can come together, across party lines, in the interest of good government and ethics and pass this amendment to move the HELP Committee to where a number of other committees already are, including Finance, Budget, and Homeland Security and Governmental Affairs. How will Trumps first 100 days impact you?Sign upfor our weekly newsletter and get breaking updates on Trumps presidency bymessaging us here. Next articleHey Media, Would You Please Stop Helping Trump Prove His Fake News Case?